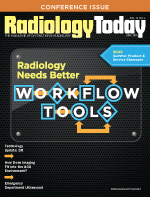 As demand for medical imaging has increased, radiology workflow has become increasingly complex. With more value-based care and bundled payments on the way, workflow complexity will likely become an even bigger challenge. It's no longer enough to share images and issue reports; adding value to health care delivery means that radiologists need to provide timely information, track performance, and train the next generation of radiologists. "If you think about how radiology workflow used to be, radiologists had to read studies and generate reports and that was pretty much it," says Tessa S. Cook, MD, PhD, an assistant professor of radiology and the chief of 3D and advanced imaging at the Hospital of the University of Pennsylvania (HUP) in Philadelphia. "But the workflow is a lot more demanding now. We have to communicate actionable findings, which are nonroutine communications; we have to keep track of productivity in various ways, and we have an educational mission. So all of those things have become part of the workflow, and we need tools to help us out with those various responsibilities." HUP is in the process of implementing Epic's Radiant RIS. Cook says RIS and voice recognition systems are beginning to incorporate functionalities that weren't always associated with day-to-day workflow but are now necessary. For example, many report-generation tools now prepopulate reports with information from the EHR and prior reports. HUP's ultrasound section pioneered a tool that allows many of the measurements that technologists make in the course of a study, whether it's for an aortic aneurysm screening study or a second-trimester anatomy scan, to be automatically prepopulated into report templates before the radiologist reviews them. This has greatly reduced the number of measurements that need to be transcribed. At RSNA 2014, Michael A. Trambert, MD, chief technology officer for his radiology group, the lead radiologist for PACS reengineering for the Cottage Health System and Sansum Clinic in Santa Barbara, California, and a medical advisor for Merge Healthcare, presented a study of the effect of report prepopulation on radiologist workflow. The study surveyed 13 staff radiologists and nine radiology residents. It found that report prepopulation saved 75 minutes per day per radiologist, avoided 86 errors per day, and decreased fatigue among radiologists. Cottage Health System and Samsum Clinic use DR Systems' Unity PACS/RIS/Reporting system. Although automation offers many benefits, Trambert says few people elsewhere are taking advantage of it. "When I did this study, one of my partners asked me, 'Isn't everyone is doing this?' He was surprised to hear from me that most other sites do not leverage this automation," Trambert says. "I go to RSNA every year, and I always ask colleagues that I meet there what they're doing and how they're doing it, and I haven't heard others talk of this kind of efficiency, nor have I seen literature discussing it elsewhere." Trambert says one benefit of tight integration between the RIS, PACS, and reporting systems is that it allows users to set up templates for various exams and specify preferences for automatic population of reports. For example, any comparison exam that Trambert opens is automatically entered under the comparison section of the report he's working on. Another feature allows technologists to efficiently enter CT dose and contrast, which is then automatically entered in the corresponding report. Trambert and his partners plan to extend this functionality to MR contrast, fluoroscopy time, interventional procedure notes, and sonographer findings. Trambert says this type of integration also simplifies the logging and viewing of peer review transactions and critical results data, making closed-loop feedback much easier. In addition, a copy findings function automatically populates a current report with the unchanged and incidental findings from a prior study, which saves time and facilitates peer review. Trambert says his research demonstrates that any practice can benefit from integration and automation. "I would hope that this research would encourage people to push their vendors to make their technology extremely tightly integrated, to allow them to get these same benefits," Trambert says. Paul J. Chang, MD, a professor of radiology and the vice chair of radiology informatics at the University of Chicago Medical Center, agrees that IT automation can help reduce errors and improve workflow. This will be increasingly important because next-generation IT tools will be expected to improve quality and efficiency. Although many people believe that those characteristics are mutually exclusive, Chang says, with proper IT use, they're not. "Both efficiency and quality loathe the same enemy, and that enemy is variability," Chang says. "So where does most of the variability come in? A lot of that variability is the result of requiring humans to do things that humans aren't good at. Humans are good at making judgments. You know what humans are terrible at? We're terrible at being integrating agents. We're terrible at transcribing. We're terrible at remembering things. For example, for oncology surveillance studies, my real contribution as a radiologist is identifying a lesion, measuring it, and seeing if it has changed. I add no value, if I then spend 10 minutes dictating those measurements; I only add inefficiency and variability." For example, oncology reports can be adversely affected by a misspoken word or typographical error. Chang and colleagues at the University of Chicago published a report in 2013 that found a 9% error rate on transcribed oncology reports, even when speech recognition software was used. These reports are often manually copied and pasted into a health care facility's oncology database; in a separate study, Chang and colleagues found an identical 9% error rate on reports that are manually copied and pasted. Chang says even a structured report is a poor mechanism to accurately and efficiently transmit quantitative data, like lesion measurements. As more quantitative data become available, the problem is likely to become more acute. To reduce inefficiency and variability in evaluating cancerous lesions, Chang and colleagues, in collaboration with Philips Healthcare, have developed a tool called Lesion Tracker. Chang is the cofounder of Stentor, which was acquired by Philips. Lesion Tracker automatically shows reference lesions on prior and current studies and transmits radiologist measurements directly from PACS to Lesion Dashboard, which is a tool for oncologists currently being evaluated. A study in the March 2015 issue of the American Journal of Roentgenology found that Lesion Tracker improved measurement reporting time and reduced errors. Another tool developed at the University of Chicago, in conjunction with Philips, is called clinical context indicator (CCI), which is intended to provide clinical context to help radiologists read exams more efficiently. Chang says an unintended consequence of computerized physician order entry, even with appropriateness criteria, has been that ordering physicians tend to describe symptoms that they know will efficiently satisfy reimbursement requirements, rather than providing detailed explanations of the patient's condition. For example, abdominal pain is a symptom that will get an exam approved, but clinical conditions, such as cancer, Crohn's disease, or HIV, may go unmentioned. Also, ordering physicians almost never indicate rule-out diagnoses, even though that information is highly useful to radiologists, because "rule out" exams don't get reimbursed. Without adequate clinical history, Chang says, radiologists cannot maximize their interpretation value. CCI extracts data from the EHR, such as the patient's health conditions and lab results, and integrates them in the PACS. Because radiologists do most of their work in PACS, CCI helps them get the necessary context more efficiently. Chang says the additional clinical context reduces waste and adds value to patient care because vague radiology reports can result in more downstream diagnostic testing. Reducing waste and adding value are the new mandates of medical care. Chang says radiology needs to get beyond the traditional definitions of interoperability, which are focused on the RIS, PACS, and speech recognition systems, and look at integrating information beyond radiology. The University of Chicago has an initiative called closed loop imaging that focuses on workflow optimization, even if a particular workflow improvement is radiology neutral, such as finding a way to schedule a patient for a radiology exam on the same day the patient has a clinical appointment. Chang says he tells all of his software developers that if a tool doesn't result in measureable improvements in efficiency, quality, or value for upstream consumers such as CFOs and CIOs and downstream consumers such as referring physicians throughout the medical enterprise, then don't build it. "And the reason for this is simple: We are no longer a revenue generator. We are no longer floating everyone's boat. Now, we're a cost center," Chang says. "Now, we have to prove our value for the entire enterprise because, in a capitated environment, other folks are going to decide what piece of the pie should go to radiology." Radiologists don't bake the pie anymore, says Chang, but if they want to keep getting a healthy slice, they need to look outside the reading room. One way to do that is to follow the image lifecycle. Vijay M. Rao, MD, FACR, a professor and the chair of the department of radiology at Thomas Jefferson University Hospital in Philadelphia, says studying the lifecycle of a radiology order provides opportunities to reduce unnecessary tasks. For example, a decision support system can facilitate the ordering of appropriate studies. Then, IT tools can also be used to ensure that the study is being protocoled appropriately. In addition, tools can be developed to assist with interpretation, which would support standardized recommendations to reduce variability. "At the point of interpretation, you can have some really interesting support tools for the radiologist," Rao says. "For example, if the radiologist is looking at a lung nodule, [he or she may be able to access] a menu of recommendations based on evidence-based criteria, such as Fleischner criteria." The final phase of the image lifecycle is communicating report findings. Rao says tools can be developed to communicate and track findings, including incidental findings, which are more difficult to track. For example, a lung nodule may need to be followed up in three months. With an appropriate IT tool, that nodule can be logged on a dashboard that will remind clinicians to follow up. Jefferson uses a Primordial results communication module that is a super layer on their iSite PACS for this purpose. Jefferson has a call room where staff logs and monitors incidental findings then calls the appropriate physician when follow-up is needed, a crucial but sometimes missed step. "The ACR has been talking about Imaging 3.0, and it's basically built on how IT tools can take you from step B to step C," Rao says. "I think there are a lot of opportunities for innovation with IT." One innovative tool that was developed by a Jefferson resident helps locate radiologists. Because radiologists can be spread over a wide geographic area, they can be difficult to find. The app, which is combined with another app that shows where people are logged into workstations, provides a phone number to the area of the hospital where the radiologist is located. If a house staffer or clinician is looking for a radiologist, the number pops up on their mobile phone, and they can call directly. The resident did a study of the app and found that it is being used frequently, clinicians like it, and it has reduced the number of reading room interruptions. IT tools are also valuable for radiology education. To help train residents in interpretation and dictation, Jefferson has developed a tool called Report Comparator, which was presented at RSNA 2013. When attending physicians review resident reports, Report Comparator logs their changes. The resident report and the attending report with tracked changes are then sent back to the resident. Rao says the tool has proven to be highly effective. An educational tool developed at HUP by radiology residents Howard Chen, MD, MBA, and Yin Jie Chen, MD, under the mentorship of Cook, is called Capricorn. It uses analytics to pull data from the RIS and create a resident-focused dashboard, allowing residents to review any report they generate over the course of their training from the beginning of their residency, week by week. It also monitors discrepancies between resident reports and attending physician changes and uses statistical analysis to compare residents' performance with institutional historical data or requirements set by professional organizations. Tools such as this make data access and comparison significantly more efficient, which is one of the most important ways that IT tools can help radiologists. "There are still some inefficiencies in our workflow," Cook says. "And I think there are great opportunities for the application of IT tools to reduce some of those inefficiencies." — David Yeager is a freelance writer and editor based in Royersford, Pennsylvania. He writes primarily about imaging informatics for Radiology Today.